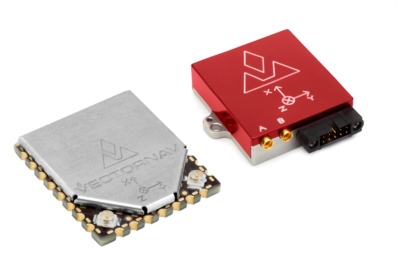 ETLG Inertial Aerosystems announces the VN-300, a miniature, high-performance Dual Antenna GNSS-Aided Inertial Navigation System that combines MEMS inertial sensors, two high-sensitivity GNSS receivers, and advanced Kalman filtering algorithms to provide optimal estimates of position, velocity, and orientation. By utilizing two separate GNSS receivers and antennas, the VN-300 enables accurate heading measurements without reliance on vehicle dynamics or magnetic sensors, providing unmatched performance under both static and dynamic conditions. The VN-300 provides the ability to accurately estimate true heading (azimuth with respect to True North) in both static as well as dynamic conditions without any reliance on magnetic sensors. This is accomplished by utilizing GPS interferometry techniques, which measure the heading of the vehicle or platform without any assumptions regarding the vehicle dynamics (RTK moving baseline technique). This is a crucial feature for applications that require an accurate heading at startup, or in situations where insufficient motion is present to perform dynamic alignment.